Annotation: The story of Sundiata, son of the king of Mali in the time of the great trading empires of Africa some eight hundred years ago, is a powerful tale of courage and determination. As a boy, Sundiata was unable to speak or walk. He overcame these obstacles, but was driven into exile by a rival queen. When Mali was overrun by intruders, 18-year-old Sundiata returned to defeat them and reclaim the throne. Full color. - Mandingo (African people); Biography; Juvenile literature. - Mandingo (African people); Kings and rulers; Juvenile literature. - Kings, queens, rulers, etc. In the thirteenth century, Sundiata overcame physical handicaps, social disgrace, and strong opposition to rule the West African trading empire of Mali. In the oral tradition of the griots (minister-like functionaries ``with the wisdom of history''), Wisniewski brings to life a story of courage from the African country of Mali. Sundiata, born to the King and his second wife, ``proved unable to speak or walk,'' and despite glowing predictions for his future he is hounded from his country. After years of exile, he is invited back to oust a tyrant and return his land to prosperity and peace. This retelling, though imbued with dignity and intelligence, proves somewhat confusing. Children may not be able to follow the convoluted series of events, while the multiplicity of characters--most with strange, hard-to-pronounce names--could well befuddle even the most assiduous reader. Wisniewski's stunning cut-paper illustrations, however, introduce to the text a striking vitality and beauty. Historically accurate images are sharp without starkness, expressive of raw power and delicate fragility by turns, and full of strong dynamism and motion. Bright rainbow colors capture the fabrics of Africa, and the text's patterned borders are suggestive of kilim rugs. An unremarkable narrative redeemed by inspired artwork. Ages 5-9. (Oct.) Copyright 1992 Cahners Business Information. 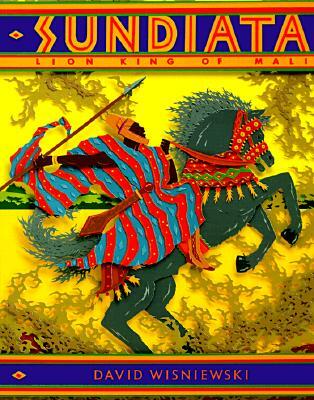 Gr 2-4-- An appealing biography of Sundiata, credited as the founder of the Mali empire. A lengthy author's note informs readers as to how little firsthand information on the topic is available, and that what is known has been handed down orally by griots , or African storytellers. Therefore, the narrative has the distinctive, if somewhat mystical, flow of an oral history. Sundiata neither walks nor speaks for the first seven years of his life, but is still named heir over his older brother. Regardless of the pronouncement, following the king's death, Sundiata and his mother are forced into exile. How the Lion King of Mali defeats his enemies and becomes the rightful ruler makes for an exciting tale. Wisniewski's characteristic artwork (vivid colored paper designs that have been intricately cut, arranged, mounted, and then photographed) add to the drama of the tale and are consistent with the folkloric tone. The characters have personality and vitality, and the setting has a texture and richness that heightens climactic moments of the story. Neither straightforward biography nor folktale, this is an interesting combination of the two. While some younger listeners may have difficulty following the somewhat choppy nature of the narrative as years fly by between the major events, older children will appreciate both the flavor and intrigue. All in all, another fine effort from a talented author/illustrator. --Linda Greengrass, Bank Street College Library, NY Copyright 1992 Cahners Business Information.